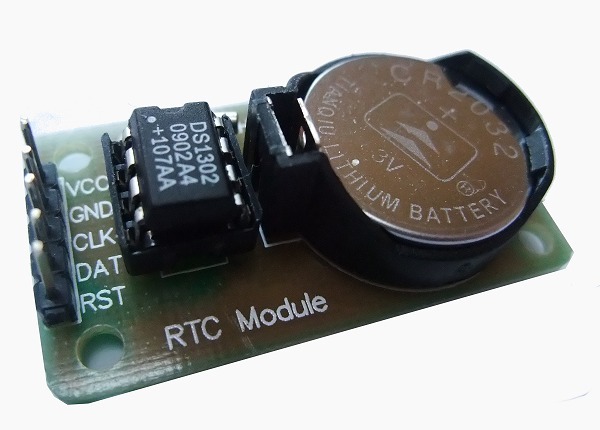 To keep costs down, one of the bits of hardware omitted from the Raspberry Pi is a Real Time Clock (RTC). When you boot up your Raspberry Pi it will have forgotten what the current date and time was and will default (on mine at least) to 30 November 1999. The Raspian "wheezy" installation that we have been using has NTP installed. This stands for Network Time Protocol and means that if your Raspberry Pi is connected to the internet it should periodically update its internal clock to that of one of the many clock servers out on the internet. If you are not connected to the internet, then you may want to connect your Raspberry Pi to a Real Time Clock chip which has a battery backup so that the date and time are kept accurate. The DS1302 chip uses a slightly quirky serial interface which we won't go into here, but it is all detailed in the datasheet. Luckily for us, an article in the Sept 2012 issue of Everyday Practical Electronics (EPE) discusses using this chip with the Raspberry Pi and provides a nice program (written in C) which can be used to set the RTC date and time on the module and also to read the date and time and set the Raspberry Pi's date and time. There is a wiring diagram on the EPE magazine page, but unfortunately it is wrong as they have CLK connected to GPIO#17 and RST (CE) connected to GPIO#21. These two connections should be swapped. You should set this command to run when the Raspberry Pi boots up. There are many ways to do this, so we will leave it up to you to decide which method is best for you. I also found that a pullup resistor is needed between DAT and VCC (= 3.3V). A 10k..30k resistor seems to work fine.